Obama will say whatever is needed in order to win the election. Here is what he said during the 2008 Presidential campaign, but actions speak louder than words and this article examines what he has done. Obama’s foreign policy of Apology and Appeasement serves a distinct purpose and fits into a clear agenda that has remained elusive until now. Spurred by the 9/11 terrorist attack in Benghazi which resulted in the murder of four Americans, including US Ambassador Christopher Stevens, investigative journalists around the globe have been laser-focused on finding and delivering the facts surrounding this well-planned terrorist massacre. But there’s another aspect of what Obama has done with this crisis that’s much bigger than the attack itself. What we’re actually seeing is Obama’s use of specific tactics that we’ve seen him use before. These tactics are used to pro-actively advance his “Muslim World” agenda, which he first spoke about at length in Cairo. So, what is the agenda? Exploring Obama’s handling of each crisis that’s occurred in the past four years, we can clearly see four key characteristics of his agenda. Obama publicly apologizes to the terrorists for what Americans have done. What does this action do? It provides an excuse/cover for their attacks and creates a narrative which US media spins relentlessly to manipulate Americans into thinking the terrorists may have been justified in their attack. This leads the discussion in a direction that focuses on what America has done, rather than what the terrorists have done. Portraying America as the bad guy facilitates the rise of the Muslim Brotherhood by deflecting attention away from what they’ve done. There are numerous examples – the YouTube video created by an American, the burning of the defiled Qurans by the US military, etc. Obama and Clinton have already signed onto the global blasphemy law (16/18) and Obama is publicly moving Americans in that direction. The gravity of such a move may be lost on most, but for those who are awake and know history, giving the government the power to imprison people for speech is a gateway to hell. It is the polar opposite of America’s foundation, principles, law and culture. We’ve seen this done throughout history in other countries and we know what it means and where it leads. Another tactic Obama uses to advance his agenda is reflected in what his DHS is doing to American citizens. Think about the NDAA, the modifications he made to the Patriot Act, his TSA, his program called “If you see something, say something,” the huge Utah facility and the Fusion Centers that are collecting massive amounts of data on us, American citizens. 4th Amendment – gone. The Senate report on their investigation of the DHS confirms that they are naming citizens, not terrorists. Obama is using the terrorist attacks as an excuse to siphon more of our tax dollars to Muslim Brotherhood-controlled countries. For Obama, it’s never been about spreading the wealth within the US; it’s all about taking from the US to give to other countries who seek to destroy the US. Our money is being used to empower our enemies and, at the same time, to plunge our nation further into debt and poverty in order to bring about an economic collapse. As all radical Progressives know, chaos enables radical transformation. Obama’s actions regarding the Muslim World have transformed the Middle East whereby the Muslim Brotherhood has risen to unimaginable heights of power – Egypt being a prime example. Setting the entire Middle East on fire and fueling the chaos with apology and appeasement has been a powerful tool in aiding the rise of America’s enemies. The result is chaos, instability and uncertainty in our own country. Some Americans think we are to blame while others are doing their homework and getting educated about the Muslim World’s goal to destroy Western Civilization. For those who may be uncertain about whether or not Obama has fueled chaos, ask yourself what actions he has taken that have resulted in stability in the Middle East and here at home. We’ve seen the opposite; under Obama’s reign, the Middle East has been more unstable than we’ve ever seen in our lifetime. Radical transformation is occurring before our very eyes. It is true that the Middle East is on fire and Obama is fanning the flames by design. Magareif said the “high degree of accuracy” in which the attack was executed—with rocket-propelled grenades and mortar shells—is proof that the assault was preplanned, and not carried out by inexperienced protesters. He said he believes “al-Qaida elements” were involved but stopped short of directly accusing the terrorist group of planning it. Although the Interim Libyan President told the truth about what has happened in his country, the Obama administration continued to say the opposite, continued to push the American-made YouTube video as the reason for the attack, and Obama’s US media outlets continued to spin in favor of his lies. Another example is when we saw Obama and Clinton scramble and issue conflicting reports each time new details were revealed. It was obvious that they were not counting on these facts reaching the light of day. As a result, we’ve seen them in auto-shake at times. But the $70,000 ad they ran in the Middle East spoke volumes about their determination to continue to fan the flames of chaos and blame America instead of the terrorists. One need not be a National Defense expert to see what Obama has been doing. All that’s needed is a willingness to open our eyes and look. When it comes to all things Middle East, Obama’s actions reflect his deep bow at the feet of those who want to destroy America. Obama doesn’t serve as America’s President, he rules on behalf of those who want to destroy and transform America into something that’s unrecognizable. If you’re still not sure, ask yourself, “When has Obama defended the US against the Muslim Brotherhood terrorists?” Do an internet search and you will see articles about his defense of the Muslim Brotherhood, but nothing on his defense of the US. Obama’s incessant berating of the US while deliberately weakening our defenses, elevating the Muslim Brotherhood and aiding their rise to power is stunning and horrifying to those of us who are paying attention. We watch as media black-outs persist and the propaganda and lies fly faster than the speed of light from him and his media minions. 1. To prevent the overthrow of the Iranian government, Obama did not speak publicly in support the people of Iran when they rose up in protest and wanted Ahmadinejad, the Islamic tyrant, removed from power. 2. Throughout his Presidency, Obama has ensured the continuation of Iran’s nuclear missile development while stripping America of our nuclear capabilities and ceding to Russia, an ally of Iran, via the START Treaty. Then Obama is caught on an open mic telling Russia that he only has one more election and then he’ll have more flexibility. 3. Obama publicly ignores Iran’s pronouncement and promise to bring death to America and Israel. 1. To aide the overthrow of the Egyptian government, Obama supported the “community organized” protests in Egypt (yes, Obama’s Code Pink and others were there), went into auto-shake when he thought Mubarak wouldn’t step down and used the resources of his Presidency to support the Muslim Brotherhood rise to power in Egypt. 3. Obama sent weaponry and billions of US taxpayer dollars to Egypt after their Muslim Brotherhood President, Morsi, made it clear that Jerusalem will be the capital of Egypt (i.e. they will kill the Jews and overtake Israel). 1. To aide the overthrow of the Libyan government, Obama took the US to war under the guise of a dangerous UN Doctrine, “Responsibility To Protect” (R2P) concocted by Anti-Semite Samantha Powers, Obama’s Senior Director of Multilateral Affairs on the Staff of the National Security Council (who happens to be married to Cass Sunstein and supported by George Soros). 2. Obama armed Libyan rebels in defiance of intelligence that indicated Al-Qaeda terrorists were among those rebels. The ex-SEAL that was murdered in Benghazi with Ambassador Stevens stated that their mission was to recover weapons. Surely Obama didn’t want Americans to know that, while he was conducting the illegal war in Libya and telling us there would be no boots on the ground, he did have boots on the ground supplying US weapons to Al-Qaeda terrorists. 1. US Soldiers – Fatalities are up 405% under Obama as Commander In Chief. US Soldiers – Wounded are up 1200% under Obama. Obama’s Director of National Intelligence, James Clapper, tells Congress and the American people that the Muslim Brotherhood movement is “largely secular” (“Muslim,” oh really?) that “has eschewed violence” even though we know they are the terrorist umbrella organization that created Al-Qaeda, Taliban, Hezbollah and Hamas as well as CAIR, ISNA, MSA and many other organizations that operate freely in America and have penetrated and infiltrated our government at the highest levels. Obama stopped our space program and re-defined NASA’s primary purpose as reaching out to the Muslim World to help them feel good about themselves. Obama’s DHS redefines terrorists as patriotic American’s in their April 2009 DHS report. Obama removes all references to Islam and Islamic terrorists from government training manuals, documents and websites and he dictates that anyone in the government who speaks of it is to be fired. Obama supported the release of the Pan Am Flight 103 Libyan terrorist as shown in THIS White House letter. Obama and Clinton removed restrictions to bring a known terrorist into our White House. This terrorist came to our White House to demand the release of the blind Sheikh, Omar Abel-Rahman, who masterminded the 1993 terrorist attack on the World Trade Center that killed seven Americans and injured a thousand. Obama has been in talks with the Muslim Brotherhood (including Egypt’s new Muslim Brotherhood President, Morsi) to release the blind Sheikh. It appears highly likely that Obama will release him after the November election whether he wins a second term or not. Obama gave a deep bow to the Saudi King; never before done by a US President. 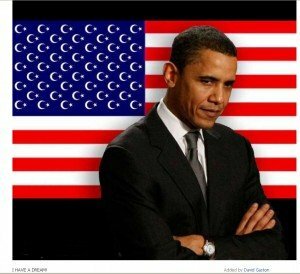 Obama supports the Ground Zero Mosque even though more than 70% of New Yorkers are against it and Obama knows that Islam builds Mosque’s at the sites they conquer. Obama gave a big pay day to Egypt for the release of American hostages. Among the hostages was the son of Ray LaHood, Obama’s Secretary of Transportation. Obama orders the military to burn Bibles that were sent to our troops in Afghanistan. Obama apologized for the burning of defiled Korans at a US base in Afghanistan despite the fact that burning them is in accordance with Islamic law. Obama fueled the manufactured outrage against our soldiers which cost American soldiers their lives. Obama has brought members of the Muslim Brotherhood into his administration, including the DHS, at the highest levels. Huma Abedin, close advisor to Clinton, is the daughter of Muslim Brotherhood parents, sister to her Muslim Brotherhood brother and she worked with Muslim Brotherhood operatives until taking a position in Obama’s State Department. Also see Muslim Brotherhood in Our White House and the Murder of SEAL Team Six. See Muslim Brotherhood In Our White House – Vetting Obama. Obama’s community organizers and terrorist Weather Underground friends organized the Gaza Flotilla. When Israeli soldiers boarded the Flotilla and were attacked, the Obama administration lied about what actually occurred by claiming it was the Israeli’s who attacked. His lie was later debunked by the actual video footage. Obama’s administration refuses to state that Jerusalem is the capital of Israel. Obama’s administration refuses to state that they will not criminalize speech against any religion. Obama called for Israel to return to the indefensible 1967 borders. Obama instructed the DNC to remove Jerusalem and God from the Democratic platform. Public pressure drove them to amend the platform; however, the delegates voted against reinstating Jerusalem and God. In opposition of the vote, it was reinstated anyway – again, due to public/political pressure. Obama’s DNC embraces radical Islam with their Jumah event. Obama’s Ramadan dinner guest list hides attendance of stealth Jihadists tied to Hamas and Muslim Brotherhood. Obama knows Hezbollah is entering through our southern border, yet he continues his impeachable offense of not enforcing US immigration law so that Hezbollah, drug cartels and other illegals can flow freely into our country. When we look at the facts and the direction Obama has taken us, there is no doubt his “Muslim World” journey over the past four years has been active, targeted, consistent and deliberate. The consequences of that journey… of Obama’s actions in America and across the globe is visibly profound and indisputably dangerous for our country, our safety and our way of life. To further understand Obama’s “Muslim World” journey, Americans need to look at this Welcome to The Project and they also need to know about Civilization Jihad because Obama’s actions demonstrate that he fully supports it and appears to be using our White House as its headquarters. “The Explanatory Memorandum (click here for the original document in Arabic) explains that the Muslim Brotherhood-organized “Islamic Movement” in the US is a “settlement process” to establish itself in the United States and, once entrenched, to undertake a “grand jihad” characterized as a “civilization jihadist” mission under Muslim Brotherhood direction. What Obama is doing is not an accident, incompetence or miscalculation. Quite the opposite; Obama is deliberately using his position as President of the United States to advance the reach and power of the Muslim Brotherhood and their Islamic terrorist organizations. The destination?… Destroy America from within and obliterate Israel. So you see, Obama’s Apology and Appeasement is a deliberate policy that gives cover to the terrorists in order to strengthen and empower the radical Islamic “Muslim World” while, at the same time, weakening and transforming America to ensure her demise. Fueling chaos, financing their terror and aiding their rise and our fall is on full display for all to see.